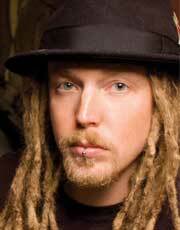 Barry Kerch was born August 7th in Colorado Springs, Colorado. Barry played his first drum at the age of 7. It was a snare and part a deal he made with his parents to perfect the basics of drumming before getting his first drum kit. Two years later he got his first kit. Barry took many lessons and played all types of music. His passion for drumming was deep and influences wide-ranging. He played in the marching band from elementary school all the way through college at the University of Central Florida where he earned a degree in anthropology. Barry played in many band throughout his early career before landing the role as Shinedown's drummer in 2000. Along with Brent, Barry is an original member of Shinedown.